celebrated the chemistry of the intellect” that marked for him Masson as the painter who understood the full implications of the surrealist project. 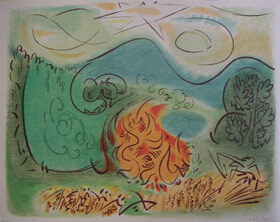 1958 – Retrospective of engravings by L’Albertina, Vienna. More than 30 works at Venice Biennale. 1965 – Restrospective at Musee National d’Art Moderne, Paris. 1976 – Retrospective at MOMA, New York then to Houston and Paris. First retrospective of drawings at Musee d’Art Moderne de la Ville de Paris.